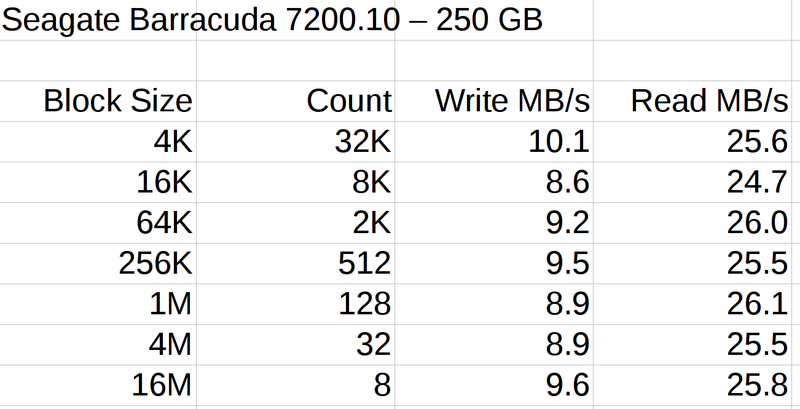 The discussion about scrubbing hard drives suggested I really should be using larger block sizes to wring better performance from the hardware. For the BS (“block size”) parameter, 1K = 1024 and 1KB = 1000. Similarly for 1M vs. 1MB. Each operation transfers 128 MB (128 x 220 = 131 x 106) bytes. The variations probably come from other stuff going on, most notably the USB-to-serial adapter driving the plotter while I’m testing a tweak to the Superformula demo code. Reads ever so much faster than writes, so the USB adapter definitely isn’t getting in the way; I assume the drive accepts the commands & data as fast as its little heads can carry them away. The data, being relentlessly pseudo-random, won’t get compressed along the way. So, in round numbers, the block size just absolutely does not make any difference. I installed an SSD on this box a while ago, so the 3.5 GB/s disk-to-discard speed represents the SSD’s read rate. The 298 MB/s disk-to-disk speed would be its write speed, probably with some clever buffering going on. So the real bandwidth limitation in wiping a disk comes from the pseudo-random generator behind /dev/urandom, not the disk or USB interface. It would probably be faster to fill a 1 GB (or more) file with noise at 14 MB/s, then copy it enough times to fill the drive at whatever speed the drive can handle it. Thanks, Edward, for figuring that out!